Attracting new customers is still an important activity for businesses but now they have become more concerned about retaining their existing customers. When existing customers leave due to poor customer services, they will choose your closest competitor even if they have to pay more than what they paid you. Customers have become the most important entity in the today’s business model and it is just not possible to run a successful business without keeping them satisfied. 1. A research showed that more than 86% of the customers are willing to pay more for better customer services. Further, they are also willing to change the vendor if the other one is offering better services even if they have to pay more. Thus, poor customer service can easily negate the advantage of vendors who offer services and products at cheaper rates as compared to their competitors. 2. More than 60 million hours of customers were wasted on hold time with call centers in 2012 in US. If you can’t understand the importance of your customer’s time then you don’t deserve to have them. Long hold times is one of the biggest problems voiced by customers who usually change their vendors when it gets too much for them. 3. 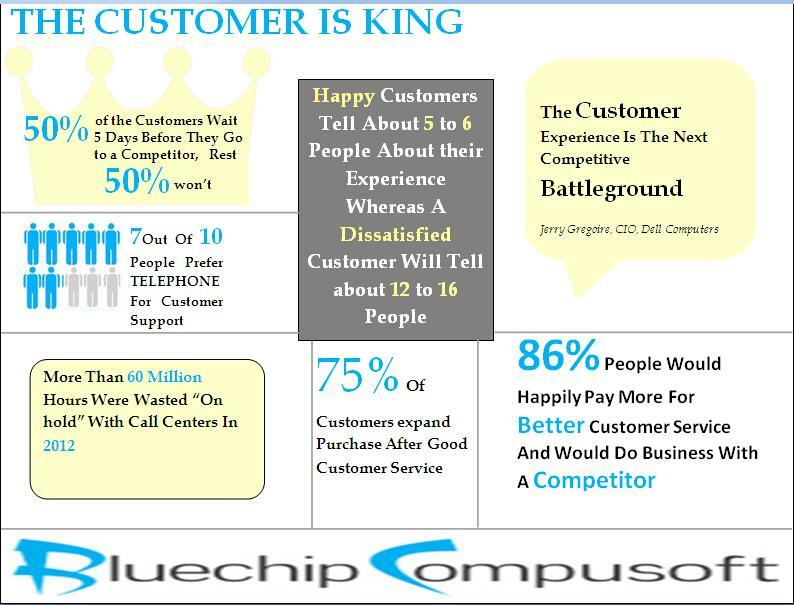 Only 50% of the customers are willing to wait for 5 or more days before they move on to a new service provider. This should be a warning sign for businesses as the rest are not even willing to wait for 5 days. Today’s customer has become a lot more spontaneous and active than it used to be a few years ago. Therefore organizations should try to keep them well satisfied and provide them solutions as soon as possible. 4. Telephone is still the most preferred choice of customers for getting customer support. It has been found than 7 out of 10 customers still prefer telephone over other modes of communication for customer support services. However, it still leaves around 30% of the customers which is a very big share. Therefore you need to have your presence on them too. 5. If you provide higher levels of customer support to your customers then it is very likely that more than around 75% of them would expand their purchase the next time. Thus, it is a sure shot way of increasing opportunities for your business. Today, customers hold too much power as even a slight fluctuation in the customer base can have very big effect on a business. This makes it important for organizations to outsource their customer care services to an experienced and reputed call center services provider. These vendors hold expertise in providing solutions to customers and can work miracles for businesses.